Goslings Black Seal 151 Proof Bermuda Overproof Dark Rum is a popular Rum available from TheDrinkShop in 70cl to buy online. Visit TheDrinkShop for the best price for 70cl of Goslings Black Seal 151 Proof Bermuda Overproof Dark Rum or compare prices on our other Rum products. In the spring of 1806, London wine & spirits merchant James Gosling set out from England aboard the chartered clipper Mercury with merchandise bound for the Virginias. The voyage was a difficult one. Ninety-one consecutive days of calm left the crew and passengers in dire straits and the charter of Mercury was fast running out. The ship eventually made port in St. Georges, Bermuda, where Gosling and his family decided to set up shop rather than press on to America. James Gosling opened a shop on King's Parade, St George's in December 1806. To this day the company remains the oldest surviving business in Bermuda and is still a family concern. Where to buy Goslings Black Seal 151 Proof Bermuda Overproof Dark Rum ? 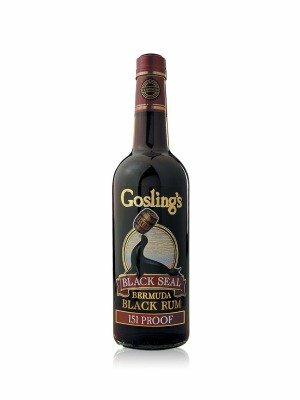 Goslings Black Seal 151 Proof Bermuda Overproof Dark Rum Supermarkets & Stockists. You can buy Goslings Black Seal 151 Proof Bermuda Overproof Dark Rum online in most retailers and find it in the Rum aisle in supermarkets but we found the best deals online for Goslings Black Seal 151 Proof Bermuda Overproof Dark Rum in TheDrinkShop, 31dover.com, and others. Compare the current price of Goslings Black Seal 151 Proof Bermuda Overproof Dark Rum in 70cl size in the table of offers below. Simply click on the button to order Goslings Black Seal 151 Proof Bermuda Overproof Dark Rum online now.